Sandwiched between two storefront churches on a wide, barren stretch of International Boulevard, Masala Cuisine doesn’t look like much: red graffiti on the facade, a takeout window covered in bulletproof glass. But don’t let the humble environs deceive: Masala Cuisine may be the closest thing you’ll experience in a restaurant setting to being invited into the home of a wonderful Indian cook. The home-style approach means your meal might take a while, but dishes like rich, fragrant butter chicken and malai kofta (vegetable dumplings in a creamy, cashew-paste-thickened sauce) all taste fresher and more flavorful than your usual curry house fare. Don’t miss the mokki di roti with sarson ka saag, an off-menu Punjabi specialty only available on the weekends: thick corn-flour “tortillas,” hand made while you wait, served with a purée of mustard greens and spinach — perhaps the most flavorful saag you’ll ever taste. Takeout orders should be placed at least an hour in advance if possible. Casual, community-minded, and exceedingly delicious. A year filled with killer street snacks, obscure rice noodles, and world-class fried chicken. 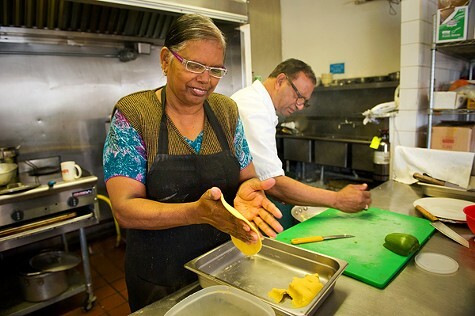 Oakland's Most Authentic Home-Style Indian Food? The husband-and-wife team behind Masala Cuisine serves up uncommonly fresh and flavorful dishes that far exceed your standard Indian fare.